Life With Murder (Director: John Kastner): 20-year-old Mason Jenkins murdered his 18-year-old sister with multiple shotgun blasts to the head on January 6, 1998. The crime occurred in the home he resided in with his only sibling and parents, in the small town of Chatham, Ontario, and Mason was convicted of first-degree-murder after his shaky alibi was deemed not credible. Mason maintained his innocence until 2007, when he finally relented and provided a strange, irrational reason for having shot his sister, with whom he’d apparently always been close. 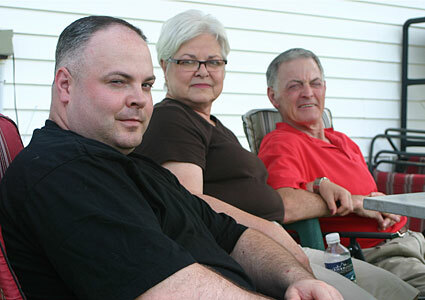 Despite the hell their son put them through, the parents, Leslie and Brian, still choose to keep him in their lives, making regular visits to Mason at Warkworth Institution, a medium-security correctional facility. Director/writer/producer John Kastner, a three-time Emmy winner, has a veritable goldmine of bizarre, intriguing details to work with in Life With Murder, with a fairly equal balance given to both a dissection of the crime, and its consequences and aftermath. Neither side is easy to watch, especially the latter. Kastner presents a thorough probing of the case, having gained access to police interrogation videos, the 911 call, crime scene documentation, and interviews with detectives from the case. The interrogation videos are quite fascinating to watch, but the interviews with the grieving parents, some from just mere hours after the murder occurred, are disturbing and uncomfortable viewing. The fact that the mother herself made repeated requests to the Chatham police to release the tapes for inclusion in the film doesn’t make the experience of watching them feel any less invasive or wrong. Credit Kastner with digging deep to uncover previously unheard details about the case, including an exploration of Mason’s belated confession, not to mention a blindsiding bombshell about the crime that ratchets up the creep factor by several notches. Despite the rich ingredients with which it has to work, Kastner’s movie left me feeling unfulfilled and empty, like it should have had much more of an impact. Leslie’s statement that “you don’t throw a kid away” and the unconditional love she and Brian have for Mason, even after what he did (and especially after that bombshell, which I won’t spoil) just seem totally at odds with logic and reason, and only added to my frustration with the movie. Another mystery: the parents never moved out of the home where the murder took place. The film also ends up playing as something less cinematic and more suited to television, like an extended version of the CBC’s “The Fifth Estate” (which isn’t a knock on that program, as they do a lot of excellent work). This entry was posted in Documentaries, Film Festivals, Hot Docs and tagged #hotdocs10, crime, family, murder. Bookmark the permalink. This is the second time I’ve read a negative review of this film that seems to stem from a discomfort with the bizarre nature of the subject matter. It’s not that I don’t understand that perspective. It isn’t terribly satisfying to not see these people actually get what’s going on right in front of them and their lack of connection also keeps them disconnected from the viewer. I just found that there was so much more coming through in what wasn’t being said. Their complete disassociation with reality and the bizarro world that creates fascinated me to no end. Thanks for the comment, Joseph. You make a good point with your “I just found that there was so much more coming through in what wasn’t being said” line.